NEW HUB: Leong (inset) is confident that its track record will stand the company in good stead in any plans to develop Sungai Besi. Property developer Mah Sing Group Bhd is keen to do more commercial developments in Sungai Besi, Kuala Lumpur, as the location is the latest commercial hub, says its top official. Business Times was made to understand that there was still commercial industrial land in the vicinity that could be used for development although the total hectarage was not known. "If the opportunity permits, we are definitely thinking of developing this area, riding on our branding and track record to expand further," group managing director and group chief executive Datuk Seri Leong Hoy Kum told reporters after the groundbreaking ceremony for Mah Sing's Southgate development, located along Jalan Sungai Besi, on Saturday. While Mah Sing wants to increase its landbank in Sungai Besi, the developer is not in a hurry to make a purchase. "Whatever land we buy, we want to ensure we look out for shareholder value and the market must be able to absorb the demand," Leong said. On Southgate, en bloc sales for its Apex Block and Corporate Building are expected to be finalised by the year-end. "We have interest from private investors and also equity funds because there are very few freehold land (areas) in Kuala Lumpur to buy," deputy chief operating officer Andy Chua said. Interested parties include those from the Middle East, Singapore and South Korea. The three remaining blocks of Southgate - Vox, Vivo and Verve - offer office suites and retail lots. More than 80 per cent of Vivo has been taken up, while Vox and Verve are seeing about 50 per cent take-up each. 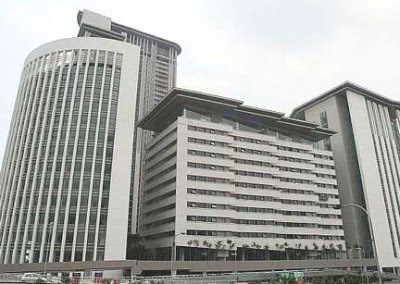 Chua said the rental yield was estimated to be eight per cent, but added that he expected it to increase because of growing demand for good freehold office space in Kuala Lumpur and the insufficient supply. "Also, with construction cost going up, there will be good potential for capital appreciation in future," he said. On Mah Sing's performance, Leong said it was on track to hitting its RM560 million sales target for the year. "Having locked in unbilled sales of RM1 billion and another RM3 billion gross development value (on remaining projects), this can last us for the next five years even without our acquiring new land," he said. PROPERTY developer Mah Sing Group Bhd will begin its first international project within two years, says its top official. Although overall, Asian economies have slowed, Mah Sing said it was the best time for the developer to plan and explore markets such as Vietnam, China, India and Indonesia. "Once we find the right project, we may start in one or two years. The economy in Vietnam should recover in a year or so. Therefore, we are looking at residential and commercial developments in Vietnam," Mah Sing group managing director and group chief executive Datuk Seri Leong Hoy Kum said. Business Times had previously reported that the developer was looking at a RM1 billion township project with a local partner in Vietnam. Leong did not rule out the possibility of carrying out industrial developments as well. "We can even put up an industrial park in Indonesia. But we are market-driven and will cater for what the market needs," he said. PROPERTY developer Asia Pacific Land Bhd (AP Land) yesterday launched a commercial development project in China's Changshu City, marking its first foray into the country. 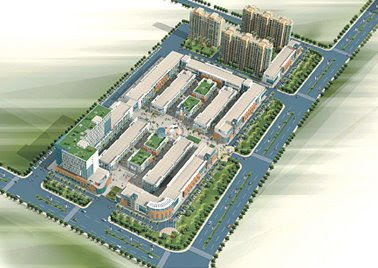 The project, known as Platinum Galaxy Boulevard and located in the province of Jiangsu, will have a gross development value of about RM800 million once it is completed in three years. It sits on some 65,421 square metres of land which had been bought for about RM44.8 million. AP Land's wholly-owned subsidiary, Changshu Platinum Landmark Ltd, will undertake the development. "We have chosen Changshu City due to the growing affluent and friendly foreign investor policies," Low Gee Teong, the company's joint managing director, said in a press statement. Low and the vice mayor of the city, Fang Jiang Gou, performed the official ground-breaking ceremony at the property development site yesterday. Platinum Galaxy Boulevard will consist of 14 blocks in phase one of commercial units, with unique features and feng-shui elements, Low said. The project is meant to cater to the needs of fast-expanding multinational companies as well as local ones. According to Low, Changshu City has over 200 million multinational enterprises with established manufacturing and industrial operations. "It will provide multinational and Chinese companies with an ideal platform for them to conduct their businesses as it combines style, functionality and tradition," he said. Changshu City, popularly known as the "Land of Fortune", has a population of three million and 800,000 floating residents. Come late 2009, Singapore’s vibrant Marina Bay waterfront will feature a new and magnificent destination - The Marina Bay Sands. The Marina Bay Sands is being developed by Marina Bay Sands Pte Ltd, a subsidiary of Las Vegas Sands Corp, a leading global integrated resorts developer and an industry leader in the meetings, incentives, conventions and exhibitions (MICE) market in the US. According to Marina Bay Sands Pte Ltd general manager George Tanasijevich, construction of Marina Bay Sands is on-track and on-target for an end-2009 opening. The total size of the Marina Bay Sands site exceeds 15 hectares with the MICE space occupying more than 120,000 sq m; three hotel towers with more than 2,600 rooms; over 750,000 sq ft of retail and F&B outlets; theatres with approximately 4,000 seats; casino and an event plaza which will accommodate 10,000 people. “Our three hotel towers; MICE facilities; casino and theatres areas are expected to be topped off in mid-2009. Currently, the development of Tower 1 is at level 13; Tower 2 at level 11 and Tower 3 at level 9. “In the MICE area, sub-structure works are well established and progressing, and superstructure works are well underway and rising above ground. “Casino sub-structure works are also progressing well and superstructure works are about to commence above ground,” Tanasijevich told StarBiz. 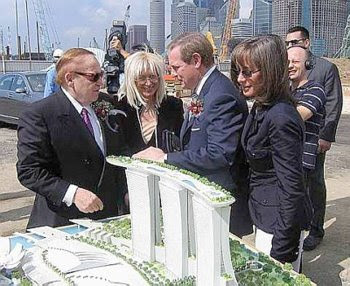 Las Vegas Sands, which was awarded the bid for Singapore’s first integrated resort (IR) in May 2006, will invest more than S$5bil to develop The Marina Bay Sands, said to be one of the largest investments in the world for a single IR. The IR is expected to generate S$2.7bil to Singapore’s annual gross domestic product and create 33,000 jobs throughout the economy by 2015. Tanasijevich said the Marina Bay Sands’ opening would be a powerful catalyst to propel Singapore’s status as a leading MICE hub and enhanced the city state’s position as one of the world’s premier business and leisure destinations. “As the first luxury IR in Southeast Asia, Marina Bay Sands will offer all visitors new and world-class experiences in dining, shopping, entertainment and MICE. In addition, the design of the development, by world-renowned architect Moshe Safdie, is unique and will integrate seamlessly with its surroundings at downtown Marina Bay. Two iconic architectural features of Marina Bay Sands are the inspiring ArtScience Museum and the sky park offering expansive 360 degree views of Singapore’s city skyline. “Marina Bay Sands is committed to helping Singapore achieve its economic, tourism and social goals. To that end, we are working closely with the Ministry of Manpower, Workforce Development Agency, National Trades Union Congress and Singapore Tourism Board to ensure that there is a sufficient pool of skilled talent for the sector. for the MICE sector in the city state. “Singapore was also ranked as the top international meeting city in the world by the Union of International Associations for the first time this year,” he noted. The company’s in-house MICE team is leveraging on its extensive experience operating in Asia to market the IR’s MICE facilities to its global network of event organisers. The team has received an enthusiastic response from organisers of events for industries including medical/ pharmaceutical, finance, IT/telecoms and logistics. “Marina Bay Sands aims to help position Singapore as a leading leisure, tourism and MICE destination, and support the country in achieving its goals of increasing tourism receipts to S$30 billion and visitor arrivals to 17 million in 2015. MARINA Bay Sands is expected to be profitable from day one and the expected payback timeframe is between five and eight years. “Overall, we remain extremely optimistic about the prospects for Marina Bay Sands and the future of the tourism industry in Singapore with China, India, Indonesia, Malaysia and Thailand serving as key source countries for both the business and leisure tourist market,” Marina Bay Sands Pte Ltd general manager George Tanasijevich said. He said Singapore had proven to be resilient in challenging times. According to him, there is massive potential for integrated resorts in this part of the world, especially with demand from the booming markets of China and India. “Multinational corporations seeking to hold corporate events or participate in exhibitions gravitate towards such strong markets where they anticipate demand. The company’s optimism is also driven by factors like the strong appeal of the integrated resort format that the Marina Bay Sands offers, its network of properties in Las Vegas and Macau, and the extensive network of travel operators worlwide. These strengths would enable Marina Bay Sands to attract many different and diverse customer segments, and strategically target its marketing efforts. “With our parent company Las Vegas Sands Corp’s unsurpassed track record in building world-class integrated resorts, Asian operating experience and MICE expertise, we are confident that Marina Bay Sands will be a destination filled with buzz, excitement, and something for everyone,” Tanasijevich said. Las Vegas Sands has been awarded a 30-year concession to develop and operate the IR on Marina Bay by the Singapore government. The Las Vegas, Nevada-based company owns The Venetian Resort Hotel Casino and the Sands Expo and Convention Center in Las Vegas and The Sands Macao in the People’s Republic of China (PRC) Special Administrative Region of Macao. The company’s two additional integrated resorts - The Palazzo Resort Hotel Casino in Las Vegas and The Venetian Macao Resort Hotel Casino in Macao, opened last year. Sunrise Bhd is continuing to launch “super-condos” in Mont’ Kiara despite fears of an economic slowdown. In the pipeline is the 460-unit 10 Mont’ Kiara which may set a new benchmark price. The company, which was the first property developer to launch the RM1mil “super-condo” eight years ago, continues to set new benchmarks not only in pricing but also quality and service. Sunrise general manager (branding & corporate communications) Joachim Ng recalled how Sunrise shocked the market when it launched its Mont’ Kiara Damai in 2000, the first “super-condo” that broke the RM1mil per unit mark in Mont’ Kiara. Since then, the public-listed company went on to launch more “super-condos” priced at an average of RM1mil and above. They include Mont’ Kiara Aman and Mont’ Kiara Banyan. In 2006, Sunrise launched the 10 Mont’ Kiara where the units were priced above RM2mil each or about RM530 per sq ft (psf). While other developers went for smaller units, Sunrise continued building large units of 2,500 to 4,000 sq ft.
“The success of 10 Mont’ Kiara showed that this affluent suburb can take a price level of RM2mil,” he said, adding that another benchmark was set when it launched the 11 Mont’ Kiara last September at RM700 psf and climbing to RM890 psf for the latest units. Ng said 65% of Sunrise’s residents were foreign expatriates and their families, mainly from Japan, Korea, Britain, the United States, Sweden, India and Indonesia. The average occupancy of its condominiums is 82%. “Sunrise spearheaded the development here 15 years ago. Its philosophy has always been creating value-added products and it gave so much back to its purchasers in terms of excellent services from property management, security, traffic control to cleaning public roads,” he said. He said new players who came in about five years ago had benefited from Sunrise’s efforts. An example is the Solaris Mont’ Kiara where its many food and beverage outlets would meet the growing demand for eating and entertainment facilities. Solaris Dutamas Phase 1 is due for completion this September while the project would be finished in first quarter of 2010. “The other developers are riding on Sunrise’s infrastructure. While we’re trying to differentiate ourselves from others, they have no problem identifying themselves with us as they too call their area Mont’ Kiara although they are further away,” said Ng. Ng said Singapore’s Building and Construction Authority (BCA) recently conferred the Green Mark Certified Award to 11 Mont’ Kiara, making it the first residential development in Malaysia to achieve this distinction in environment sustainability in several criteria: energy and water efficiency, indoor environment quality, innovation and site/project management. Sunrise, which had won numerous awards, was also named Malaysia’s Best Residential Developer in Euromoney’s 2008 Liquid Real Estate Awards. It is also thrice winner of the Malaysia Property Award (formerly known as FIABCI Award of Distinction) in 2005, 2001 and 1997 for Best Residential Development and was named Forbes Asia 200 Best Under US$1billion Company 2005. Ng said although Sunrise’s condominiums were priced at a premium (10% to 15% more), it offered a host of services to its buyers. “You may pay slightly more but in the long run it’s actually cheaper as you get to enjoy so many kinds of services and facilities,” he said, as he showed the security command centre in Plaza Mont’ Kiara where staff monitor the 38 CCTV cameras placed at strategic spots in the Jalan Kiara area. This Safe City concept has given residents and visitors a sense of security. Ng said the company spent about RM1mil yearly just on security (not including security in the condominiums) and cleaning services. It has also spent RM1.5mil on Fun Zone (opened in Sept 2006), a 4,000 sq ft upbeat community area for its 12,000 residents living in its 11 completed condominiums. Located at Aman Walk retail deck along Jalan Kiara 2, the centre is the brainchild of Sunrise Bhd executive chairman Tong Kooi Ong, who wanted the residents to foster closer bonding through free activities as reflected in its seven themed “planets”: arts, books, cuisine, drama, music, nature and sports. There is also a large play area called Space Explorer play-gym that is very popular with the children. Sunrise has built over 4,000 completed residential and commercial units in 11 condominium and two commercial projects (Plaza Mont’ Kiara/Solaris Mont’ Kiara). This does not include the Solaris Dutamas and several high-end condominiums like the 10 Mont’ Kiara, 11 Mont’ Kiara and Mont’ Kiara Meridien - all under construction. It has another 100 acres in the area to be developed over the next decade. There is an estimated 6,000 condominium and commercial units completed by other developers in the area. Ng feels the “congestion issue” had been overplayed as the current heavy traffic is mainly due to construction activities. Jalan Kiara 1 (recently made into a no-parking zone) would be widened by three feet and there would be more access roads in the future, he added. Property buyers are still keen to invest in the local market, with more than half expecting prices to rise by more than 10 per cent in the next six to 18 months, said a survey. The iProperty.com Group, Asia's leading network of property portals, announced the results of its online Asia Property Trends Survey 2008 last week. The survey tracks the buying habits and trends of about 2,000 local and overseas property buyers who visited iProperty.com and Malaysian website, www.iProperty.com.my. The survey was conducted online from August 1 to 31. "In recent times, Malaysia has proven to be an attractive place to invest in property. iProperty.com as a group has been a primary observer of this trend, and it looks no different this year based on the feedback and results we have collated." "As property values continue their consistent rise, Malaysians and those who have an interest in local property have again shown that a healthy demand still exists in this country," iProperty.com group executive chairman Patrick Grove said in a statement released yesterday. While 50 per cent of the respondents revealed that they have bought at least one property over the last 24 months, a whopping 89 per cent of them intend to buy property within the next 12 months. Some 57 per cent of respondents say buying property remains a solid and safe investment, while 52 per cent believe they could generate passive rental income from their purchases. While most of the respondents' main motivation for purchase is for their own stay, around 47 per cent of respondents are looking to buy purely for investment purposes. The survey also found that landed property remains the apparent favourite of buyers with 63 per cent keen on readymade or completed landed property while 48 per cent were set on ready-made or completed condominiums and newly-launched or uncompleted landed property. The results show that 59 per cent of respondents used the Internet as the first medium they turn to when initiating their property hunt. While over 60 per cent said it is the number one source they rely on for updates on available property. MEDICAL tourism activities in Penang are set to be boosted with the entry of a new player in Penang. The RM300 million Farrali International Specialist Hospital and Wellness Resort in Batu Kawan on the mainland is set to not only woo medical tourists from Indonesia and Thailand, but as far as the Middle East, Penang Chief Minister Lim Guan Eng said. The project will be undertaken by Kuala Lumpur-based Kumpulan Perubatan Farrali Mutiara Sdn Bhd (KPFM) and is slated for completion by 2011. The integrated medical resort, which will boost 120-bed and state-of-the-art medical equipment to treat chronic ailments like diabetes and cancer, will also boast a nursing college, convention centre, hotel and service apartments and a herbal farm. "This project complements the state government's efforts in increasing the tourism sector's current contribution of 22 per cent to the state coffers to 30 per cent in five years," he said on Saturday. Lim was speaking during a signing ceremony between KPFM and the Penang Development (PDC) for the purchase of six hectares of land at Mukim Batu Musang in Batu Kawan where the medical resort will be sited. Present were KPFM executive chairman Datuk Alias Ali and PDC general manager Datuk Rosli Jaafar. Batu Kawan is the site on mainland Penang where the Second Penang Bridge is supposed to be located. The 24km crossing will connect Batu Kawan and Batu Maung on Penang island, which is minutes from the Penang International Airport in Bayan Lepas. The new private hospital is set to offer complementary medical treatments such as acupuncture and ayurvedic treatments. 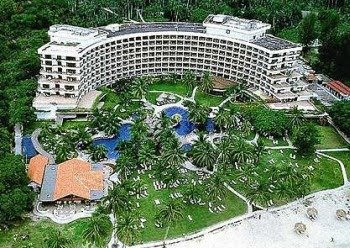 The five-star hotel resort, with 200 rooms and service apartments close to the private hospital, will cater to needs of patients and their families who intend to remain in Penang for extended periods for treatment. Other facilities like a spa, restaurants, recreational facilities and shopping outlets are also planned. Lim said with the presence of five-star medical facilities in Penang, the state will be able to tap into the lucrative medical tourism market. In 2004, about 152,000 foreign tourists sought treatment in seven private hospitals in Penang and this generated revenue of RM135 million. Medical tourists to Penang in 2001 totalled 72,000, 2002 (84,000) while the number rose to 92,000 in 2003. JOHOR Corp's hospitality arm, Puteri Hotels Sdn Bhd, has signed to manage five luxury-class hotels in Saudi Arabia beginning September 2009. The hotels, with a room inventory of between 270 and 350, will be located in Medina, Mecca, Riyadh and Jeddah. "All of the new five-star hotels are being built," managing director John J. Roozemond said. The first hotel, with a 267-room inventory, is scheduled to open in Medina in September 2009. All hotels in Saudi Arabia are automatically syariah-compliant, which means, among others, that they will not serve alcohol, have a floor specially for women and serve halal food. "There will be no entertainment except in-room entertainment," Roozemond told Business Times. A second such hotel is set to open at the end of 2009 either in Medina or Mecca. "We will manage the hotel and at the same time we will have a 50 per cent stake in the management company," he said. Even prior to the opening of the hotel, Puteri Hotels has been involved in the provision of technical assistance. The Saudi partner, Arab Resorts Areas Co (Arac), is wholly owned by one of the largest conglomerates from the Middle East - the Taiba Investment and Real Estate Development Corp. Through this partnership, The Islamic Hospitality Management Corp was created to build and manage hotels and resorts throughout Saudi Arabia, the Middle East, Malaysia, Singapore, London and other Islamic countries. Puteri Hotels, which is best known for the five-star Puteri Pacific Hotel in Johor Baru, will leverage on this opportunity to expand this hotel chain for the niche market even outside of Saudi Arabia, including Malaysia. 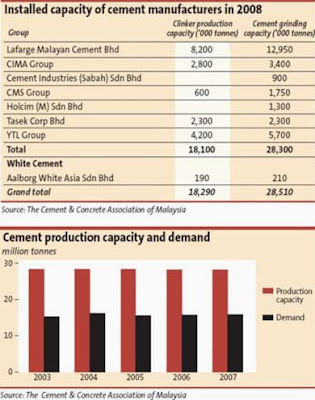 The Cement & Concrete Association of Malaysia (C&CA) expects domestic cement demand to grow marginally by 3% to 5% to about 16.33 million tonnes this year versus 15.86 million tonnes in 2007 due to a lacklustre construction industry. Chairman Tan Sri A. Razak Ramli said cement demand had remained stagnant at 15 to 16 million tonnes a year since 2003. “Despite an encouraging growth in the first half of the year, we will only see a relatively small growth in demand this year due to the slowdown in the construction industry. We hope things will be better next year. If the economy picks up next year then construction should also,” he told StarBiz. In addition to a lack of demand, the local cement industry has been a much misunderstood industry. Various accusations have been hurled at industry players including increasing cement prices after liberalisation and creating artificial shortages through orchestrated plant shutdowns. There have also been calls by various parties for the Government to remove all import duties for cement, impose an export or windfall tax and/or impose an export ban on clinker and cement to ensure sufficient domestic supply. To Razak the allegations are baseless. “There can never be a shortage of cement in Malaysia as the cement installed capacity is very high at 28.3 million tonnes,” he said. In 2007, cement production inclusive of export was only 19.48 million tonnes of which 15.86 million tonnes were consumed locally. Razak said the forecast production this year would be slightly higher at 19.62 million tonnes as domestic consumption was expected to increase to 16.33 million tonnes. 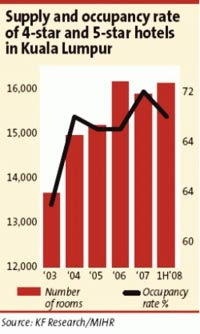 Cement export is expected to increase to 14.7% of production this year, up from 14% last year. “The Government should also not impose an export ban on cement because manufacturers can easily meet domestic demand and export the excess,” Razak said. Moreover, the Government is in full control of clinker and cement exportas every tonne can only be exported with an export license from the International Trade and Industry Ministry supported by a letter of no objection from the association. Razak said cement manufacturers were also not intentionally creating shortages by simultaneously shutting down plants for maintenance. “No manufacturer would shutdown their plants unnecessarily thus incurring production losses and additional costs including high fixed costs. Kilns require a minimum of three days to heat up to the desired temperature of 1,500 ºC. “All cement companies notify the Domestic Trade and Consumer Affairs Ministry on their scheduled plant maintenance shutdowns. The plants would also have stocked up to ensure sufficient supply,” he said, adding that unscheduled plant breakdowns, however, were beyond the manufacturers’ control. “With the increase in fuel price, many transporters are reluctant to carry bagged cement as cargo as they are low value, bulky items. Otherwise they will try to overload the lorries. There is also a lack of lorries, drivers and licences,” he added. Road Transport Department operations on overloaded tankers and lorries carrying cement and its related raw materials also added to the industry’s transport woes. Razak pointed out that although the Works Ministry had gazetted an additional 20% loading from the present permissible weight for lorries/tankers on all federal roads in Peninsula Malaysia, federal roads in east Malaysia and state roads nationwide were not covered. To help ease supply issues, the C&CA is in the midst of setting up a public hotline centre to assist those in Peninsula Malaysia who have trouble with cement supply. “Through the centre, Class F contractors will have a direct avenue to obtain cement. We will also be able to capture and build a database on public complaints on cement supply,” Razak said. On cement price increases, Razak said the industry did not raise prices indiscriminately and exorbitantly despite having absorbed cost increases of more than 60% from 1995 to 2007. There were only two price increases between 1995 and 2006 when cement prices were under the Price Control Act - 10% in August 1995 and an average of 9% in December 2006. Following cement price liberalisation on June 5, prices were only increased twice - 15% to 20% country-wide in the same month as well as an average 8% in Peninsula Malaysia in August due to an unprecedented 63% diesel price hike and a 26% rise in electricity tariff. This price will hold until December. Despite the price liberalisation, the return on investment (ROI) for the cement industry has only increased to 6% to 10% from the previous 3%. “This is still insufficient to encourage reinvestment by industry players,” Razak said, adding that the cost of a 1.2 million tonne integrated plant was about RM1bil currently. “This is why there has been no expansion programme or new plants coming on-line since 1997 although manufacturing licenses for the production of more than 14 million tonnes of cement have been issued by the Government. Fronting the Federal Highway, PJ8 is highly visible. The project comprises a serviced suite block and three blocks of offices. As one cruises along the Federal Highway towards PJ Hilton, an iconic structure rises high above the horizon. Known as PJ8, the project lies smack opposite the five-star hotel fronting the highway. Cycle and Carriage office marketing Mercedes Benz used to occupy part of the site. PJ8 in Section 8 Petaling Jaya, undertaken by IJM Properties Sdn Bhd, comprises a 38-storey block of service suites, a 12-storey office suite block and two blocks of office tower with a gross development value of RM250mil. The 4-acre IJM project is prominent by any standard and its completion is expected to give the main PJ a lift. It will help to rejuvenate what used to be a thriving PJ New Town but now perceived by many to be a little tired. At 38 storeys, the service suite block may well be the tallest. It comes with three blocks of offices. Its completion and eventual occupation will set new benchmarks, in more ways than one, sources say. While there have been pockets of change and redevelopment in other parts of PJ, much of these have been drowned by the hype and activities in the new townships in PJ North simply because of the malls in that area. The status quo is expected to remain. Nevertheless, PJ8 will add some sparkle amidst the current gloom in the sector. Says Jones Lang Wootton executive director Malathi Thevendran: “Multinational corporations (IT, media, professionals, finance & banking, airlines), oil and gas companies, embassies and offices of foreign governments will prefer a Kuala Lumpur location. “Those that are service-orientated €“ marketing, advertising, support services, data centres, backroom offices €“ will prefer PJ. Historically, the demand has been for smaller, cheaper office space which resulted in the development of shop offices. “Today, we are seeing the move towards quality corporate office towers,” she says. The PJ makeover started several years ago as new residential areas took shape and the spending power of its population grew. Old factories were done away with and replaced by a new commercial landmark. As families upgrade and move to better housing, the older established residential areas began to take on a rather exhausted facade. Time for change! Be it food and beverage outlets, retail or services, the demand of the PJ population have grown by leaps and bounds as its middle class ballooned. Other growth areas around PJ that Malathi likes include Mutiara Damansara, Bandar Utama and Damansara Perdana. Mutiara Damansara, says Malathi, has an edge over Bandar Utama and Damansara Perdana, as it is one of the best and systematically planned commercial and residential enclave in Petaling Jaya. The other areas she likes is Section 13, with its cauldron of commercial activities. But the local council will have to monitor accessibility and traffic in the years to come as more high rise commercial developments in the pipeline are completed. Jerome Hong, managing director I (agency & corporate services) of PA International Property Consultants (KL) Sdn Bhd says the eventual occupation of PJ8 will increase the number of office workers and residents travelling in and out of its immediate area. Traffic congestion may be an issue. Hong says although the developer has created several access roads into PJ8 from the flyover off Federal Highway and from Jalan Barat, the local council should address the traffic issue in this area as it is one of the main arterial roads leading to the main PJ centre. “There will need to be better traffic management for the long term,” he says. Hong says its location and access is second to none. It is close to all forms of public transport and other public amenities. It is also more visible, he says. Between PJ8 and Malton Bhd’s VSQ, another commercial project across the Federal Highway near the Tun Hussein Eye Hospital, Hong prefers PJ8. “VSQ is not so accessible in terms of road network or public amenities. The large multinational companies will also prefer floor plates in excess of 10,000 sq ft,” he says. While PJ8 is a mixed development comprising offices, retail outlets and serviced suites, VSQ offers only office facilities and a bit of food and beverage. PJ8’s serviced suites are more than 80% sold, with the remaining units now selling at an average of RM500 per sq ft compared to RM350 psf in its early days, says S K Brothers Realty (M) Sdn Bhd general manager Chan Ai Cheng. It has only one office suite left. IJM recently sold Tower C in PJ8 en bloc for about RM600 psf, setting a new benchmark. Its offices suites were tagged at RM430 psf when it was first launched. Chan says most developments will take time to occupy. In this case, its visibility and accessibility will quicken the process. Jaya33 is in the region of RM3.50 psf to RM4 psf. 3 Two Square offices in the region of RM2.30 psf to RM3.50 psf. “We can expect PJ8 to fetch rentals in the region of RM4.50 psf,” says Chan. Malaysia and Singapore have a unique relationship. We are like squabbling in-laws, but we know we cannot and will never divorce each other. You live with the tension and exchange of barbs. The ties between Malaysia and Indonesia are quite different. The animosity at times can boil over. Grudges are harboured and allowed to fester. There is a genuine fear of, and sometimes loathing for, each other. Most of that is at the political and policy levels. Many Malaysians and Indonesians love to visit each other’s country. Indonesia to Malaysians in general, is a bit of an underachiever. Naturally, Malaysia to Singaporeans, is also a bit of an underachiever. It’s time to reassess Indonesia. In many ways, the country is moving in the right direction business-wise. Recently, Qatar and Indonesia set up a US$1bil fund to invest in energy and infrastructure. Qatar is the world’s largest exporter of liquefied natural gas (LNG), while Indonesia is third. Both countries are also members of the Organisation of the Petroleum Exporting Countries (OPEC), though Indonesia has just opted out. Qatar will contribute 85% of the funds for the new fund and Indonesia the remainder. Qatar’s state investment fund, the Qatar Investment Authority (QIA), has teamed up with Abu Dhabi state enterprise International Petroleum Investment Co in March to launch a US$2bil fund. The QIA has also set up joint funds with Oman and Dubai. Indonesia is pro-Western, much like Malaysia, and could be a model for a modern Muslim nation, provided nationalist Islam (not radical Islam) doesn’t become too powerful a force in Indonesian society. Following the aftermath of the Sept 11 attacks, many were outspoken on the various failings of Muslim nations. Indonesia is a dominantly Muslim nation, with the largest Muslim population in the world, but it also has small but strong Hindu, Christian and Buddhist communities. Malaysia has generally enjoyed a better perception in the eyes of international travellers and global investors. Indonesia has had to contend with thorny events such as the Bali bombings and the East Timor massacre. If investors are to be influenced just by these events, they would be doing Indonesia and themselves a disservice. There is still pockets of “nationalistic fervour” among the political voices in Indonesia. Health Minister Siti Fadilah Supari commented in April that regional governments in Indonesia should be on their guard whenever they dealt with international investment proposals. · Would the international investors take control of Indonesian resources? · Would the foreigners be prepared to be on an equal footing with Indonesian partners, or would they adopt a lordly, colonialist stance? · Would a particular foreign investment benefit Indonesians or harm them? · To what extent would Indonesians gain from the investment? Foreign investors often lie about this matter. For example, South Kalimantan’s coal needs were less than 1 million tons per year and there was an electricity shortage crisis. Yet, at the same time, 70 million tons of coal was taken out of the province and sold internationally. Indonesia has been beset by an autocratic regime for a long time. We need to reassess the country now as the country is certainly moving away from the authoritarian system to a more democratic one. It is still taking baby steps but press freedom and the media’s brutal honesty and bravery has paved the way for a more civil society. This is an important aspect of a decentralised power system, which accords more voice to a wider spectrum of leaders and the disenfranchised. Meanwhile, according to an AT Kearney study of the top 25 most attractive investment destinations in the world, Indonesia ranks 21st. The rankings for 2007 are based on a survey of 1,000 CEOs around the world. In 2006, Indonesia did not make the top 25. Thanks to a well-respected Finance Minister in Sri Mulyani Indrawati, there has been significant economic liberalisation. Quasi-monopolies have not been protected and are expected to compete with new foreign companies. The boom in commodities over the last five years has helped the country infuse more strength into its underlying economy. Indonesia is at or near the top in palm oil, rubber, base metals, coffee and cocoa. Corporate investors across all regions are concerned about the sustainability of the global economic order. Is Indonesia the flavour of the month only because of the commodities boom? I think not, as most experts can see a sea of change enveloping the country. The commodities boom only hastens the benefits of such changes. The country is confident enough to implement several years of mandated increases in minimum wages. While some industries may have shifted or closed operations because of these new rules, these measures have also forced investors and businesses to move up the value-add curve. There has also been a decentralisation of budgetary systems, which has allowed local leaders to better manage resources and spending to their localities. Over the last three years, Indonesia has managed to enjoy more stability politically, in its currency and in economic viability. This lessens the discount on businesses in valuation models, thus resulting in better confidence among foreign investors going forward. Corruption is still a problem but one can easily see a more transparent era for Indonesia. More bigwigs have been hauled up and tainted politicians have lost their seats with greater frequency. Since beginning of 2007, there has been more than US$20bil in mergers and acquisitions and capital raising, which drove the corporate sector to new levels. The corporate sector is no longer dominated by seasoned players from the Suharto era. If you put the top business groups next to Malaysia, the latter pales in comparison. The Salim group tops the ladder with US$7.3bil (RM24.8bil) in revenues annually and is in agriculture, distribution, property management, financial services and telecommunications in Indonesia, Hong Kong, China and Singapore. Next is the Sinar Mas group with revenues of US$4.77bil (RM16.2bil), which was forced to sell Bank Internasional Indonesia (BII) following the 1997 financial crisis but has since rebuilt itself in banking with the acquisition of Bank Shinta. The Sinar Mas group can be said to have been most affected by the 1997 financial implosion as their Asia Pulp & Paper had a staggering debt load of US$14bil. Following years of negotiations and restructuring, the company has thrived. It is also the biggest national player in palm oil, with land bank of more than 1 million hectares. Khazanah Nasional Bhd has a hefty profile in Indonesia. The businesses under Khazanah has an annual revenue of US$1.8bil. Its stakes include those in Bank Lippo, Bank Niaga, Excelmindo Pratama and infrastructure joint ventures (JVs). Surprisingly, Temasek’s holdings in Indonesia has only a total annual revenue of US$1.5bil. It has stakes in Bank Danamon, BII, and various property and energy JVs. Still, the key point here is the number of business entities that have substantial revenues. How many Malaysian businesses have combined revenue of more than RM3.4bil annually? Size matters, especially when they are headed in the right direction with the proper masterplan. The government has also planned to privatise a number of SOEs, which in itself is a grand plan to better manage resources, inject competition and promote efficiency in government. All in, 37 SOEs have been identified for privatisation and/or restructuring. There has been some delay in that certain factions of the government have been delaying the process. Last year, 10 SOEs were scheduled for privatisation. However, only five are now ready to go to IPO this year: Krakatau Steel, Bank Tabungan Negara, and National Plantation Enterprises III, IV and VII. Needless to say, intense lobbying by the affected SOEs and maybe even “vested interests” must have been a large part of the delay. Still, it’s hard to deny that the country is moving in the right direction. 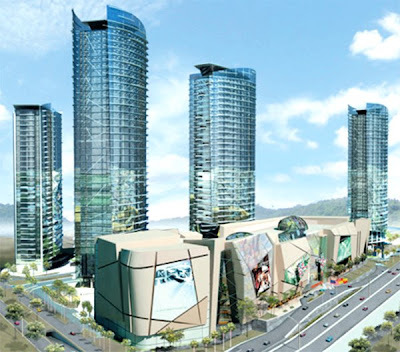 PROPERTY developer IGB Corp Bhd has pumped RM15 million into Mid Valley City, to enable fibre-optic connectivity through-out its mixed-development hub. Mid Valley City recently received MSC Malaysia Cybercentre status on September 11 under the MSC Malaysia National Roll-Out plan. The Garden Towers are designated to house the MSC Malaysia-status companies, with rental averaging between RM6 to RM7 per sq ft. These rental prices are similar to Grade A buildings located in Kuala Lumpur. "We have reserved some 300,000 sq ft of office space exclusively for these companies," said Mid Valley City Gardens Sdn Bhd chief executive officer Anthony Barragry during the MSC Malaysia status launch in Kuala Lumpur yesterday. TECHNOLOGY GROWTH: Barragry says that to remain ahead, Mid Valley City Gardens has invested in broadband services due to keen demand. Barragry said he was confident that this rental would provide the firm with a sustainable yield, adding that they were currently in talks with potential tenants. The 35-storey North and South Towers have more than one million sq ft of gross lettable area. "In the last 10 years, there has been a massive growth in technology. For us to remain ahead, we have invested in broadband (services) as there was keen demand for it," said Barragry. Mid Valley City has high speed broadband access for firms as well as incubation facilities to help small and medium industries. 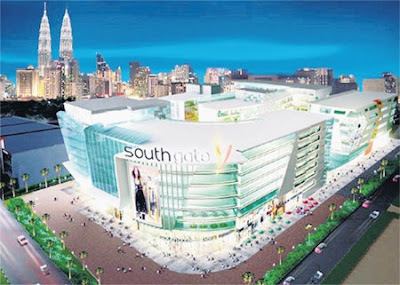 Multimedia Development Corp chief executive officer Datuk Badlisham Ghazali said several mutinational companies have shown strong interest in setting up shop at Mid Valley City. "Many companies are looking at centralised business community portals. Currently, there are 15 cybercities and cybercentres in the country," he said. Also present to officiate the launch was Science, Technology and Innovation Deputy Minister Fadhillah Yusof. KUALA LUMPUR; Mid Valley City, an integrated urban development in the Klang Valley, has received MSC Malaysia Cybercentre status. Mid Valley City Development chief executive officer Antony Patrick Barragry said RM15mil had been invested to enable the Mid Valley City to offer competitive Internet data centre rates and high-speed broadband access. ”Together with partners Macro Lynx Sdn Bhd, infrastructure manager and service provider for Mid Valley City, and 3Com, the infrastructure enabler, we will be providing world-class services to businesses,” Barragry said during a ceremony to highlight Mid Valley City’s MSC Malaysia Cybercentre status yesterday. ”To date, we have received expressions of interest from a number of parties,” he said. “The MSC Malaysia Cybercentre status given to Mid Valley City will assist MSC Malaysia status companies remain closer to their customers, as many businesses are located in the city centre and the Klang Valley,” he added. SIME Darby Bhd is one out of four investors that are keen to develop Pulau Jerejak in Penang. Chief Minister Lim Guan Eng yesterday said the other three investors are foreigners which will be backing local firms. The foreign parties are from the Middle East and the Asia-Pacific region. Without revealing details, he said Sime Darby plans to invest in a tourism-related project and this is linked to the Northern Corridor Economic Region (NCER). "We have received tremendous interest for the holistic development of Pulau Jerejak from Middle Eastern investors and Sime Darby is the first local conglomerate to express its interest," Lim told a press conference at Kompleks Tun Abdul Razak after receiving Sime Darby's president and group chief executive Datuk Seri Ahmad Zubir Murshid. Present was Invest-in-Penang Bhd executive committee chairman Datuk Lee Kah Choon. The NCER blueprint which was launched last year by Prime Minister Datuk Seri Abdullah Ahmad Badawi states that Pulau Jerejak, which once served as a penal and leper colony, has been earmarked for a premier medical tourism centre. The 362-hectare island, which is off the coast of Penang island, has so far seen only 32ha jointly developed by the Penang Development Corp and USA Holdings in the form of the Jerejak Resort and Spa. Lim said the development of Pulau Jerejak would run into billions of ringgit and would span 10 years. "The state government will likely open a tender for this project by the end of the year and all interested parties can forward their proposals then," he added. "Who is going to fund this monorail system? 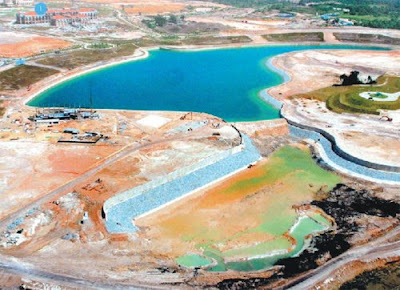 Previously, the federal government said it would fund the capital expenditure for this project but it has since said no." LONDON: House prices in Britain fell for the fourth consecutive month in September, as the credit crisis continued to worsen and the country's largest mortgage lender was forced into a takeover, the property website Rightmove reported yesterday. Average house prices across the country fell one per cent in September to STG227,438 pounds (STG1 = RM6.27). New listings per estate agent dropped to the lowest level for September that the index has ever recorded. "The housing market is on its knees and will remain so until financial institutions address the disastrous state of the mortgage funding markets," said Miles Shipside, commercial director of Rightmove. The market for residential properties has softened since the beginning of this year and is likely to continue into 2009, market experts say. The potentially negative influence on the sector is supply, said real estate valuer Regroup Associates Sdn Bhd executive chairman Christopher Boyd. In a recent survey undertaken by Regroup, it showed that there is an existing supply of 19,183 condominium units in Kuala Lumpur, with 13,902 units more under construction. The new projects launched were Gaya Bangsar, Twins @ Damansara Heights, Regalia @ Sultan Ismail, 9Madge, NorthShore Gardens, Sunway Vivaldi and Panorama in the City Centre and Mont Kiara/Sri Hartamas. The average occupancy rate for established condominiums in the city centre, Ampang Hilir, Mont Kiara, Bangsar, Kenny Hills and Damansara Heights was about 80 to 85 per cent. "Strong upmarket areas such as Damansara and Kenny Hills have limited new supply as approval for high-rise condominiums in these areas is seldom given by the planning authorities. Investors should look for quality projects here as they are extremely lettable," Boyd told Business Times. Boyd also said there will be a gradual appreciation of values in properties in Kuala Lumpur, spurred by a higher level of inflation, and because developers will not be able to restrain prices as production cost is rising. Demand from foreign investors will also increase in years to come, he added. "We have seen buyers this year from South Korea, Singapore, Hong Kong and the Middle East. While a liberal policy on foreign ownership brings a far wider market to our doorstep and encourages more and better quality development to meet international standards, it exposes the development industry to changes in the global market sentiment," Boyd said. For IJM Land Bhd managing director Datuk Soam Heng Choon, he believes that the outlook for the residential market remains strong. "If buyers like a product in a certain location, they will go for it. Demand for landed properties is still better than high-rise condominiums," he said. He said medium- to high-end properties priced from RM400,000 still have a strong market going, but sales of houses below RM400,000 are affected as buyers with a household income of less then RM5,000 hold back on buying. Mah Sing Group Bhd managing director and chief executive Datuk Seri Leong Hoy Kum said while the outlook is challenging, residential projects by branded developers, especially for landed properties, are still doing well. Leong said investors looking for capital appreciation and buy-to-stay would generally look at landed residential properties as condominiums are more for rental yield. "There are still transactions, albeit at a lower pace, as the medium- to high-end segment has a pool of buyers who are more resilient to inflation," he said. There are also foreign buyers who are still picking up the units, although not in the quantum of about a year ago. He said the mid- to high-end residential projects are more resilient to inflation and weak sentiments, and are seeing better sales. Property developer Mah Sing Group Bhd has swept three awards out of seven categories at the Euromoney Liquid Real Estate Awards 2008, including the highest honour of "Top Developer Overall Malaysia". The other two awards were "Best Office/Business Developer Malaysia" and "Best Mixed-Use Developer Malaysia". Currently in its fourth year, the awards cover developers, lenders, advisory firms, investment banks, investment managers and property management firms from more than 50 countries, across a variety of regional categories. The organiser, Euromoney Liquid Real Estate, is a leading publication focused on international real estate financial markets. The Top Developer Award is the single most important category in the developers' award and honours only one developer in each country. Mah Sing Group is recognised as the nation's major builder of quality luxury homes and forward-thinking business/commercial developer. Mah Sing currently has 14 projects in the Klang Valley, Johor Baru and Penang. The group's platter of luxurious, quality ho-mes and prime commercial projects is focused on the medium- to high-end property segments in Malaysia. The Euromoney Liquid Real Estate Award is based on surveys and assessments of real estate's sector performance and achievements over the past 12 months, and the winning companies are selected through an annual real estate awards poll organised by Euromoney magazine's research team. Target respondents include real estate developers, advisers, financial institutions, investors and the end-users. The official award presentation will be held at a gala dinner in London on October 2. The long abandoned hotel project in Precinct 5 Putrajaya will finally open its doors on November 1 - some seven years after the project started. 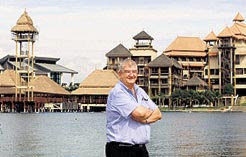 Previously known as Alam Warisan, the hotel is now rebranded as Pullman Putrajaya Lakeside. The hotel is owned and developed by Putrajaya Holdings, while French hotel and services group Accor SA will operate it. SIBOURG: The hotel, which is an upscale hotel with business people in mind, will open in phases between November 2008 and January 2009. General manager Patrick H. Sibourg said the hotel, which is an upscale hotel with business people in mind, will open in phases between November 2008 and January 2009. "Originally, there were four different blocks with four different hotels - the China Block, the Indian Block, the Borneo Block and the Malay Block. However, it is difficult to have four different hotels in the same compound. "So the direction was changed to have one hotel, but to keep the identity of the hotel and the unique experience of Malaysia's multicultural background," Sibourg told Business Times. Accordingly, the four blocks, which have also had a name change to Lotus Wing (China), Bunga Tanjung (Malay), Jasmine Wing (Indian) and Rafflesia (Borneo), will be run by a single operator. This hotel has 283 rooms, including 34 serviced apartments and 24 suites. Each block portrays the respective ethnicity in the architecture and ambience. The hotel's target group is the meeting, incentive, convention and exhibition (MICE) market. For a start, it will be ready to accommodate delegates of the International Water Skiing Festival to be held at the Putrajaya Lake. "On November 1, we plan to open the Jasmine Wing and the Rafflesia with a total of 165 rooms. The opening will be in time for the International Water Skiing Festival to be held between November 7 and 9 at the lake in front of the hotel," Sibourg said. Meanwhile, Sibourg is positive on the performance of the hotel despite adding to the number of rooms already available in the Putrajaya. In 2009, he expects the hotel to achieve 65 per cent occupancy and an average room rate of RM230. When asked where the confidence on its performance stems from, he said: "We are the only large international hotel in Putrajaya." Pullman Putrajaya expects to attract a huge corporate and government crowd predominantly from Cyberjaya and Kuala Lumpur while a smaller number of leisure travellers is expected on weekends. The hotel has 21 meeting rooms and five food and beverage outlets called The Village (a floating restaurant), China Bar and Lounge, B's (a 220-seat restaurant with a show kitchen), The Deli @ Pullman and Bar On Third. It also has a 250-seater lakefront and open-air amphitheatre as well as team-building facilities. The Klang Valley hospitality market can look forward to exciting times ahead with more new hotel developments and the entrance of more prestigious hotel players. Over the next three years, Klang Valley will see an addition of close to 5,600 hotel rooms with four and five-star rating. Those that will be completed this year include Hotel Grand Mercure Putrajaya Lakeside owned by the French-based Accor Group, Maytower Hotel Service Apartments owned by Mayland Group, Royal Chulan Tower Hotel & Residence owned by Boustead Group and Gardens Hotel and Residences owned by IGB Group. Among the world-renowned brands that will make their debut are the 240-room Four Seasons Hotel in the KLCC vicinity that is scheduled for completion in 2013, while the St Regis Hotel in KL Sentral, with a minimum of 200 hotel rooms, is scheduled to open for business in 2014. According to Zerin Properties chief executive officer Previndran Singhe, the entrance of more prestigious hotel players in the local market would act as a magnet to attract other international brands such as InterContinental, Sofitel and The Raffles to Malaysia’s shores. “There is still good growth opportunities in the local hospitality market, especially for niche players such as luxury heritage hotels in Kuala Lumpur,” Previn told StarBiz. Knight Frank Ooi and Zaharin Sdn Bhd managing director Eric Ooi said the announcement of the luxury brand, St Regis, had enhanced Malaysia’s regional standing in the five-star hotel category. “Several five-star hotel players made some exciting announcements in the first half of this year. “They include the approval for the 450-room Grand Hyatt Hotel at Jalan Pinang, Kuala Lumpur, and the entry of the prestigious St Regis Hotel,” Ooi said. The 40-storey Grand Hyatt Hotel, to be developed by the Brunei Investment Agency, will house 450 rooms and estimated to cost RM360mil. Another proposed project is the redevelopment of Bangunan MAS by Permodalan Nasional Bhd (PNB). PNB acquired Bangunan MAS from Malaysia Airlines Bhd for RM130mil two years ago and intends to redevelop the 35-storey building into a hotel and apartments. Knight Frank Research, in its latest Real Estate Highlights, said with rising operational cost and tougher economic environment, the local hotel industry was expected to undergo challenging market conditions in the second half of this year. It noted that the current supply of five-star and five-star hotel rooms in Kuala Lumpur stood at 6,760 and 9,120 respectively, with the bulk of the supply located within the tourist belts in the city such as Jalan Sultan Ismail, Jalan Ampang, Jalan Bukit Bintang and the KLCC locality. The five-star 438-room One World Hotel in Bandar Utama made its debut in January. The average occupancy rate for both four-star and five-star hotels in the city during the first six months of this year was 70%, which was 2% higher compared with the same corresponding period in 2007. Several hotels, including the Impiana KLCC, Berjaya Times Square Hotel and Renaissance Kuala Lumpur, are embarking on refurbishment works. 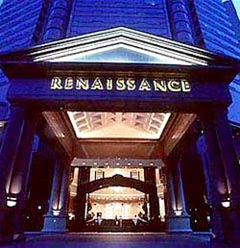 Renaissance Kuala Lumpur is being refurbished at a cost of RM153mil. Impiana KLCC will be adding another 180 rooms to its current 335 rooms while Berjaya Times Square Hotel & Convention Centre’s three-phase refurbishment and redevelopment exercise costing RM20mil is expected to be completed in September. The Renaissance Kuala Lumpur’s RM53mil facelift will be completed next year. The report said the average room rate (ARR) for five-star hotels during the January to June period was RM370, higher than RM320 recorded for the corresponding period in 2007. The hotels which recorded ARR above RM300 in the first half of 2008 include Hilton Kuala Lumpur (RM460), JW Marriott (RM390), Mandarin Oriental (RM650) and The Westin (RM450). 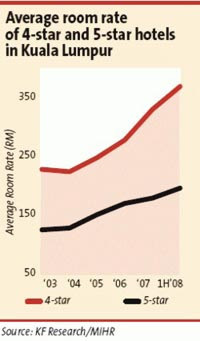 The ARR for five-star hotels during the same period was RM200, 10% higher than RM180 recorded last year. Several hotels that achieved ARR of more than RM200 during the first half of 2008 were Hotel Maya (RM320), Traders Hotel (RM320), Concorde Hotel (RM250) and Boulevard Hotel at Mid Valley (RM220). Higher tourist arrivals and receipts in the first six months of 2008 have contributed to the strong performance by the hotels. The full year tourist arrivals for 2008 is expected to reach 22.5 million against 21 million in 2007, while tourist receipts will increase to RM50bil this year from RM45.7bil in 2007. Meanwhile, the setting up of Pemudah, a special taskforce to reduce red tape in the application of licenses and permits for the setting up of new hotels, in February is expected to give a boost to the local hotel market’s competitiveness in the region. Branding has become an important pillar in the property development business with more industry players jumping onto the “branding” bandwagon. The “location, location, location” mantra while still preached by many real estate “gurus” seems to be less prominent. Instead the “location, concept, branding” mantra has been the battle cry over the past several years. However, it is foolhardy to believe that one could have a successful brand overnight without earning it. Developers must ensure that they have the right kind of products and services to earn them a good reputation. There is no short cut to success. You can have the best advertising company to map out your branding strategy but if you fail to deliver on time, have an inferior product and poor after-sales services, no amount of branding promotions can earn you the trust and respect from your buyers. This applies to all businesses as well as professional services. Thus, branding should be a constant reminder of the special strength of a company and not mere visual recognition of a logo. Take the case of a famous Japanese brand that I have been supporting for many years. The power of its brand was so strong that I subconsciously bought all three video cameras from the same brand. When the first video camera developed faults after three to four years, I bought the second one but this too developed faults after the second year. Again I bought the third video camera but this too had problems just after a year and repair bill came to more than a third of the original price. Enough is enough. I dumped the brand. A product must not only look good but also durable and competitively priced. This is why developers who build quality houses find many repeat buyers who also encourage others to buy from the same developer. Developers like SP Setia, Sunrise, I&P, Sime Darby Property,Titijaya, Naza TTDI, Brunsfield and Sunway City have such strong brands because they do not compromise on quality. However, maintaining that brand image is even more difficult as people has high expectation. That is why many of the reputable developers continue to promote their brand and win strings of awards. Naza TTDI Sdn Bhd (formerly TTDI Development Sdn Bhd), despite having proven itself the past 35 years, is not resting on its laurels. “We have a strong passion to deliver quality consistently. We ensure that every new projects is better than the preceding one,” said Datuk Johan Ariffin, managing director of Naza TTDI. Johan said during The Edge Malaysia Top Property Developers Awards 2008 that Naza TTDI was rated 21st among all listed and unlisted property developers in the country. Among the unlisted participants, it ranked third. “Considering that there are over 1,000 property developers in Malaysia today, the 21st ranking puts Naza TTDI in the top 2% of developers in Malaysia. “We will strive to do better for our purchasers and hope to further improve on our ranking in 2009,” he added. Meanwhile, newcomers like the Amarin Group have also raised its profile when it launched a major branding exercise recently. The exercise saw the launch of its website www.amarin.com.my and its latest project website www.amarin.com.my/wickham. The group has been actively branding itself since late last year. Its Amarin brand is synonymous with indulgent, luxurious, innovative lifestyles. 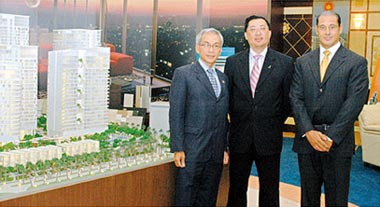 The company sold out its first development Amarin Kiara in Mont’ Kiara. Its second project, Amarin Wickham is a low-density, low-rise luxury development of only 21 units of duplexes and triplexes in Kuala Lumpur’s prestigious embassy district in U-Thant. Units with sizes from 3,000 to 9,000 sq ft are priced at an average of RM4mil per unit. Its executive director Lee Vun-Tsir said international investors would seek products that have the best value.